The spinal column is an intricate framework of interlocking bones that, when viewed from the side, form a gentle "S" shape. The spine is a sophisticated system— both fragile and sturdy— of muscles, bones, joints, ligaments, discs, a spinal cord, and nerves. Joints, called "facet joints," and discs allow the spine to bend and twist and absorb mild shocks and bumps. The brain, spinal cord, and nerves manage your body's movement by sending messages to muscles. Supporting the entire structure is an intricate system of ligaments, tendons, and discs. The vertebrae, facet joints, and discs are vertically stacked in a healthy spine. Ligaments support that alignment and discs, which are flexible, spongy pads, absorb shocks between the vertebrae and joints. The spine has four natural curves, which help to evenly distribute the loads incurred by daily activity—from sitting, walking, and running, to lifting and carrying. The sacrum, which lies at the base of your spine between the fifth lumbar and the tailbone, or coccyx, is a triangular-shaped bone made up of five fused parts. These are called "S1, S2, S3, S4 and S5." These unique parts connect to your pelvis by way of structures called sacroiliac joints. Your neck, which is also called the upper cervical spine, is distinguished by two large vertebrae. One is called the upper bone, or atlas, and the other is called the lower bone, or axis. These bones in your cervical spine do not need discs and protect the medulla oblongata, or lower brainstem. Inside the medulla oblongata are reflex centers that regulate such things as your heartbeat, breathing, the diameter of your blood vessels, swallowing, vomiting, coughing, sneezing, and hiccupping. Almost half your brain's 12 cranial nerves originate in the medulla and control such things as balance and hearing, taste, swallowing, salivation, the digestive system, head and neck muscles, and the tongue. One can easily see that if the upper bones of your spinal cord are out of alignment, a whole host of things can go wrong in your body, some subtle, some not-so-subtle. However, it is not uncommon for many of us to have some sort of misalignment in these structures as we go through the daily trials and tribulations of life. Vertebral bodies – These are the large bony structures you see in the spinal anatomy and essentially are the support column of your back. 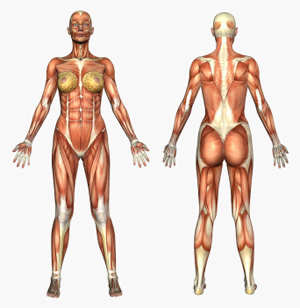 This amazing structure supports about half of your body's weight; your muscles do the job of the remaining half. Vertebral bodies are separated by small spaces containing discs. Most of the vertebral bodies in your spine have several joints that allow your back to bend and flex. When you bend forward, your hips provide about half of the impact, while your lower spine, or lumbar, takes on the rest. Vertebral discs – The shock absorbers that are found between vertebral bodies, discs are essentially made up of two major parts: a tough outer core and a soft inner core. When you are born, these discs are mostly water. As you get older, the discs slowly lose their water content and get harder. As they dehydrate over time, your discs provide less of that soft and cushy support they provided when they were new. Because they have no blood supply and few nerve endings, discs are unable to repair themselves. Disc degeneration can be painful in later years; in some cases, the inner core of the discs leak proteins that can inflame the nerve roots. Spinal cord and nerve roots – As it leaves the base of your brain, your spinal cord weaves through the neck and upper back, ending up at the bottom of your thoracic spine. Actually, your spine ends before it reaches your lower back, shooting off a series of nerve roots that are dispersed through bony canals throughout your body. Muscles – The soft tissue surrounding your spine is largely composed of muscles, which support your spine as it bends and flexes. Two large muscles in your lower back, called erector spinae, help hold up the spine. The soft tissues that envelop and support your spine make up an intricate network of muscles. With the help of your body's abdominal muscles, this network helps to keep your body stabilized and upright, and allows it to bend and flex. Extensors – These are composed of back and gluteal muscles. These muscles help keep your back straight, assist in efforts involving lifting, and moving your thigh away from the body. Flexors – These are your abdominal and iliopsoas muscles, which support the spine from the front. They also control the arch of your lower back and move the thigh in toward the body. Obliques (also called rotators) – These "side" muscles stabilize your spine when you are standing upright and help rotate your spine and maintain proper posture and spinal curvature. Your spinal cord is like a thick braid formed by billions of these nerves. Your body has approximately 15 billion nerve cells—all of which receive and transmit nerve impulses by way of the spinal cord. These impulses control virtually all functions of your body—from your senses to mobility. Nerve roots are named for the level of your spine they exit from, beginning with a letter and followed by a number. For example, a nerve root in the cervical spine may be called "C6,"while a nerve root in the lumbar region may be called "L4."